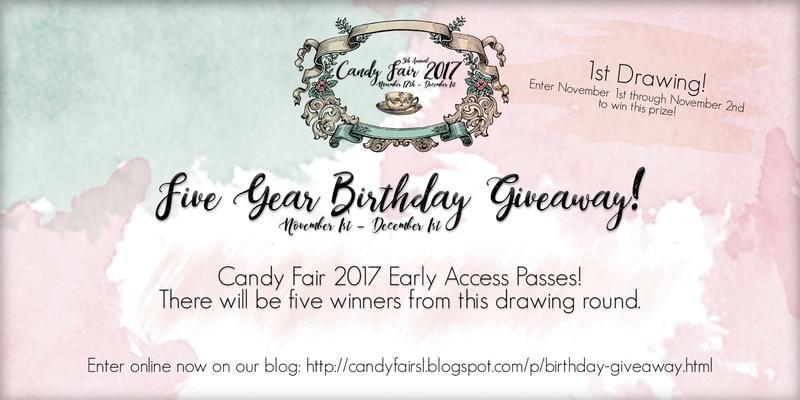 Candy Fair 2017 Birthday Giveaway Drawing #1 Now Open through November 2nd! We are kicking off our Candy Fair 2017 Five Year Birthday Giveaway with drawing #1 which will be open November 1st through November 2nd. The prize for this drawing is Candy Fair 2017 Early Access Passes! There will be five winners this round. The early access passes are to come on our blogger day which is November 15th! Usually only our official bloggers for the fair have access to early shop that day but we will be giving five lucky winners the chance to as well! Enter on our blog be sure to read the rules and info. Good luck everyone! The winner for this drawing will be announced November 3rd!